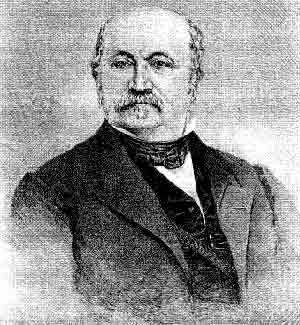 John A. Sutter was born in Baden in 1803 of Swiss parents, and was proud of his connection with the only republic of consequence in Europe. He was a warm admirer of the United States, and some of his friends had persuaded him to come across the Atlantic. He first went to a friend in Indiana with whom he staid awhile, helping to clear land, but it was business that he was not accustomed to. So he made his way to St. Louis and invested what means he had in merchandise, and went out as a New Mexican trader to Santa Fe. Having been unsuccessful at Santa Fe, he returned to St. Louis, joined a party of trappers, went to the Rocky Mountains, and found his way down the Columbia River to Fort Vancouver. There he formed plans for trying to get down to the coast of California to establish a colony. He took a vessel that went to the Sandwich Islands, and there communicated his plans to people who assisted him. But as there was no vessel going direct from the Sandwich Islands to California, he had to take a Russian vessel by way of Sitka. He got such credit and help as he could in the Sandwich Islands and  induced five or six natives to accompany him to start the contemplated colony. He expected to send to Europe and the United States for his colonists. When he came to the coast of California, in 1840, he had an interview with the governor, Alvarado, and obtained permission to explore the country and find a place for his colony. He came to the bay of San Francisco, procured a small boat and explored the largest river he could find, and selected the site where the city of Sacramento now stands. A short time before we arrived Sutter had bought out the Russian-American Fur Company at Fort Ross and Bodega on the Pacific. That company had a charter from Spain to take furs, but had no right to the land. The charter had about expired. Against the protest of the California authorities they had extended their settlement southward some twenty miles farther than they had any right to, and had occupied the country to, and even beyond, the bay of Bodega. The time came when the taking of furs was no longer profitable; the Russians were ordered to vacate and return to Sitka. They wished to sell out all their personal property and whatever remaining right they had to the land. So Sutter bought them out  cattle and horses; a little vessel of about twenty-five tons burden, called a launch; and other property, including forty odd pieces of old rusty cannon and one or two small brass pieces, with a quantity of old French flint-lock muskets pronounced by Sutter to be of those lost by Bonaparte in 18l2 in his disastrous retreat from Moscow. This ordnance Sutter conveyed up the Sacramento River on the launch to his colony. As soon as the native Californians heard that he had bought out the Russians and was beginning to fortify himself by taking up the cannon they began to fear him. They were doubtless jealous because Americans and other foreigners had already commenced to make the place their headquarters, and they foresaw that Sutter's fort would be for them, especially for Americans, what it naturally did become in fact, a place of protection and general rendezvous; and so they threatened to break it up. Sutter had not yet actually received his grant; he had simply taken preliminary steps and had obtained permission to settle and proceed to colonize. These threats were made before he had begun the fort, much less built it, and Sutter felt insecure. He had a good many Indians whom he had collected about him, and a few white men (perhaps fifteen or twenty) and some Sandwich Islanders. When he heard of the coming of our thirty men he inferred at once that we would soon reach him and be an additional protection. With this feeling of security, even before the arrival of our party Sutter was so indiscreet as to write a letter to the governor or to some one in authority, saying that he wanted to hear no more threats of dispossession, for he was now able not only to defend himself but to go and chastise them. That letter having been despatched to the city of Mexico, the authorities there sent a new governor in 1842 with about six hundred troops to subdue Sutter. But the new governor, Manuel Micheltorena, was an intelligent man. He knew the history of California and was aware that nearly all of his predecessors had been expelled by insurrections of the native Californians. Sutter sent a courier to meet the governor before his arrival at Los Angeles, with a letter in French, conveying his greetings to the governor, expressing a most cordial welcome, and submitting cheerfully and entirely to his authority. In this way the governor and Sutter became fast friends, and through Sutter the Americans had a friend in Governor Micheltorena. Nearly everybody who came to California made it a point to reach Sutter's Fort. Sutter was one of the most liberal and hospitable of men. Everybody was welcome  one man or a hundred, it was all the same. He had peculiar traits; his necessities compelled him to take all he could buy, and he paid all he could pay; but he failed to keep up with his payments. And so he soon found himself immensely  almost hopelessly  involved in debt. His debt to the Russians amounted at first to something near one hundred thousand dollars. Interest increased apace. He had agreed to pay in wheat, but his crops failed. He struggled in every way, sowing large areas to wheat, increasing his cattle and horses, and trying to build a flouring mill. He kept his launch running to and from the bay, carrying down hides, tallow, furs, wheat, etc., returning with lumber sawed by hand in the redwood groves nearest the bay and other supplies. On an average it took a month to make a trip. The fare for each person was five dollars, including board. Sutter started many other new enterprises in order to find relief from his embarrassments; but, in spite of all he could do, these increased. Every year found him, worse and worse off; but it was partly his own fault. He employed men  not because he always needed and could profitably employ them, but because in the kindness of his heart it simply became a habit to employ everybody who wanted employment. As long as he had anything he trusted any one with everything he wanted  responsible or otherwise, acquaintances and strangers alike. Most of the labor was done by Indians, chiefly wild ones, except a few from the Missions who spoke Spanish. The wild ones learned Spanish so far as they learned anything, that being the language of the country, and everybody had to learn something of it. The number of men employed by Sutter may be stated at from 100 to 500  the latter number at harvest time. Among them were blacksmiths, carpenters, tanners, gunsmiths, vaqueros, farmers, gardeners, weavers (to weave course woolen blankets), hunters, sawyers (to saw lumber by hand, a custom known in England), sheep-herders, trappers, and, later, millwrights and a distiller. In a word, Sutter started every business and enterprise possible. He tried to maintain a sort of military discipline. Cannon were mounted, and pointed in every direction through embrasures in the walls and bastions. The solders were Indians, and every evening after coming from work they were drilled under a white officer, generally a German, marching to the music of fife and drum. A sentry was always at the gate, and regular bells called men to and from work. Sutter's Fort was an important point from the very beginning of the colony. The building of the fort and all subsequent immigration added to its importance, for that was the first point of destination to those who came by way of Oregon or direct across the plains. The fort was begun in 1842 and finished in 1844. There was no town till after the gold discovery in 1848, when it became the bustling, buzzing center for merchants, traders, miners, etc., and every available room was in demand. In 1849 Sacramento City was laid off on the river two miles west of the fort, and the town grew up there at once into a city. The first town was laid off by Hastings and myself in the month of January, 1846,  about three or four miles below the mouth of the American River, and called Sutterville. But first the Mexican war, then the lull which always follows excitement, and then the rush and roar of the gold discovery prevented its building up till it was too late. Attempts were several times made to revive Sutterville, but Sacramento City had become too strong to be removed. Sutter always called his colony and fort "New Helvetia," in spite of which the name mostly used by others, before the Mexican war, was Sutter's Fort, or Sacramento, and later Sacramento altogether. Sutter's many enterprises continued to create a growing demand for lumber. Every year, and sometimes more than once, he sent parties into the mountains to explore for an available site to build a sawmill on the Sacramento River or some of its tributaries, by which the lumber could be rafted down to the fort. There was no want of timber or of water power in the mountains, but the canyon features of the streams rendered rafting impracticable. 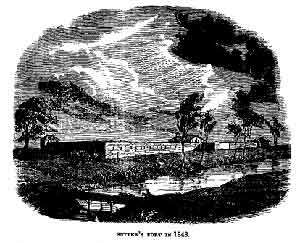 The year after the war (1847) Sutter's needs for lumber were even greater than ever, although his embarrassments had increased and his ability to undertake new enterprises became less and less. Yet, never discouraged, nothing daunted, another hunt must be made for a sawmill site. This time Marshall happened to be the man chosen by Sutter to search the mountains. He was gone about a month, and returned with a most favorable report. James W. Marshall went across the plains to Oregon in 1844, and thence came to California the next year. He was a wheelwright by trade, but, being very ingenious, he could turn his hand to almost anything. So he acted as carpenter for Sutter, and did many other things, among which I may mention making wheels for spinning wool, and looms, reeds, and shuttles for weaving yarn into coarse blankets for the Indians, who did the carding, spinning, weaving, and all other labor. In 1846 Marshall went through the war to its close as a private. Besides his ingenuity as a mechanic, he had most singular traits. Almost everyone pronounced him half crazy or hare-brained. He was certainly eccentric, and perhaps somewhat flighty. His insanity, however, if he had any, was of a harmless kind; he was neither vicious nor quarrelsome. He had great, almost overweening, confidence in his ability to do anything as a mechanic. I wrote the contract between Sutter and him to build the mill. Sutter was to furnish the means; Marshall was to build and run the mill, and have a share of the lumber for his compensation. His idea was to haul the lumber part way and raft it down the American River to Sacramento, and thence, his part of it, down the Sacramento River and through Suisun and San Pablo bays to San Francisco for a market. Marshall's mind, in some respects at least, must have been unbalanced. It is hard to conceive how any sane man could have been so wide of the mark, or how any one could have selected such a site for a saw-mill under the circumstances. Surely no other man than Marshall ever entertained so wild a scheme as that of rafting sawed lumber down the canyons of the American River, and no other man than Sutter would have been so confiding and credulous as to patronize him. From: Life in California Before the Gold Discovery by John Bidwell.